Portland’s largest fall car show – featuring the United States Marine Corps. Antique – Classic – Muscle – Street Rods – Sports – Exotics – Trucks – Motorcycles. Entry fee is a new unwrapped toy per occupant for a deserving child, or a donation to the Toys-for-Tots program. Hard to believe this will be our third year helping out the U.S. Marines’ Toys-for-Tots program with hundreds of presents for kids for the holidays — no doubt, this year more than ever families will need some extra help around Christmas time with gift giving. Don’t miss this great family event — a wonderful cause, a huge assortment of vehicles (we expect about 200), delicious food and we even have a DYNAMOMETER available this year from www.portable-dyno.com! If enough folks sign up, some of the proceeds from the dyno will go back to the show, too. This show was a smash success in 2009 and 2010 with about 200 cars attending. It’s free to attend but each person in a car should bring a new unwrapped present for the program. Some folks collect them at work and end up filling their cars up — it’s quite a sight! This is a really easy event because you can just show up in your vehicle (any and all are welcomed to attend), line up and enjoy the day. It starts at 10 and ends at 2. Somewhere around noon Monday Night Posse (www.MondayNightPosse.com) will put on a live show with some groovin’ tunes that blur the line between rock and country. As always, a huge thanks to Stan and Cheryl Page who organize this event along with car clubs around the state who help out as well. This is an all-club event, not presented by any one car club. Stan and Cheryl travel the state and even New England almost every weekend going to shows and helping to make a difference and inviting folks wherever they go. This show actually ran a couple years elsewhere before it relocated to our facility. So, actually a happy 5th Anniversary to the Toys-for-Tots Labor Day show! This was the grand finale at our first-hopefully-annual Portland Police Department Police Athletic League’s on June 25, 2011. Portland Motor Club owner Bill Waldron puts on a tire show in his 1965 Plymouth Belvedere drag car. They don’t make ’em like that anymore! And speaking of not making ’em like that anymore, this was former Portland Police Chief James Craig’s almost last official act, serving as a show judge while also having inspired and helped to organize it. Thanks, Chief — we miss you! Thanks for the show. Portland Motor Club is a specialty car storage and care facility featuring secure, climate-controlled and heated, year-round and seasonal vehicle storage. Designed as a marina for car owners, members can come and go anytime in their favorite set of wheels from a classic Mopar to a vintage MG TD to a Aston Martin DB9. Members also have access to this handsome facility for social gatherings and business meetings. For more information, call 207-775-1770 or email to info@portlandmotorclub.com. There is also a top-notch detailing facility on-site, Portland Detailing (www.PortlandDetailing.com). It was a spectacular day especially for an often off-and-on rainy one. We all dodged raindrops here and there but by and large folks hung in there and there was a great spirit about the show which must still have attracted a few hundred folks. In addition to all the good the event did for the Portland Police Department’s Police Activities League with the couple thousands of dollars raised (thank you sponsors*, supporters, entrants and everyone that attended and helped to make this great success even for a rainyish day) as well as the show being a great send-off to our beloved Police Chief James Craig who inspired this hopefully annual event, one of the lasting legacies of the show is the intriguing places that mention of it showed up around the internet. From Bangor to Boston to Cincinnati to a carpet cleaning service in Portland Oregon, from Indiana to India to Australia, from Music.aol.com to SoccerNews.com the eco-conscientious TreeHugger.com, this story got out there… way out there! Here’s a partial list of some of the places this story found itself. Let us know if you find any other really quirky ones out there. Send us an email to info@portlandmotorclub.com. And special thanks to Southern Maine Motors and the other local dealers who helped put some late model icing on the classic car cake with some new muscle cars. Looks like the sun might peek out around 10 so hopefully you’ll plan to stop by even if the weather isn’t perfect — the show will be! PORTLAND MOTOR CLUB • 275 Presumpscot St.
$15 includes entering one vehicle (choose from over a dozen categories) and includes a show T-shirt! This is a brand new show and unlike Portland (or probably anywhere else) has never seen before! 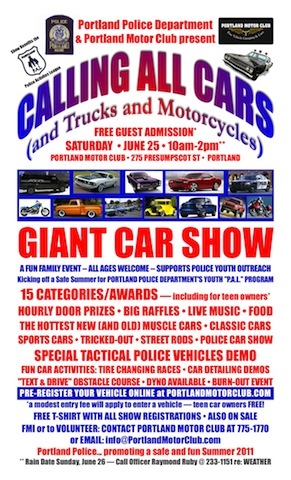 Portland Motor Club has teamed up with the Portland Police Department to create a unique show to promote the community policing approach that Chief James Craig has brought to Portland. The Chief is also a car nut so we have him to thank for this — and maybe for years to come! We have put together a truly exciting show that is designed to appeal to car show lovers as well as to young people who have never been to anything like it. It’s all to benefit the Portland Police Department’s Youth Activities League to support the great work the PPD is doing creating positive experiences for area youth who might otherwise have such positive opportunities. In addition to a “regular” car show (which can also include trucks and bikes), local dealerships are bringing some of coolest new cars around to add to the excitement. Because the police are the force behind this show, we are also including vintage police cars as well as some of the highest-tech special police tactical vehicles to the mix. Add in some drift cars, street rods, tricked out cars and who knows what else and it’s a pretty wild combination of vehicles. Then we’ve got a “text and drive obstacle course experience” on a golf cart, a portable dynamometer (www.portable-dyno.com), and indoor karting vehicle plus some BIG RAFFLES and great door prizes. Add some delicious food from Bingas Wingas (www.BingasWingas.com) and Siano’s Brick Oven Pizza (www.SianosBrickOven.com) who will be donating part of their proceeds and Cap’n Eli’s Soda Wagon will be on hand. Plus BIG HITS Y100.9 and Smooth Jazz WJZP 105.1 as well as some live music from area teens thanks to the Maine Academy of Modern Music (www.MaineAcademyOfModernMusic.org). Thanks, too, to the Portland Press Herald (www.PressHerald.com) for helping us with media sponsorship and the generous package of ads they donated to this great event and worthy cause. 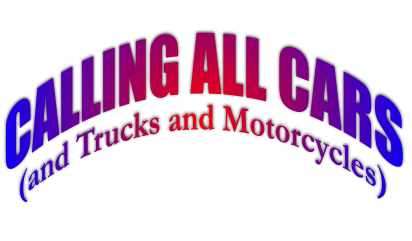 Click to download full-sized/full-quality CALLING ALL CARS poster: CALLING ALL CARS POSTER — you can help to spread the word about the show by sending a link to this page by email or on FaceBook, print out copies on legal-sized paper and hand them out or take them to a car show! We’re starting to put together our calendar for the 2011 Car Show and Cruise season and just want to remind anyone and everyone to send in your listings for any type of car-related event to us at info@portlandmotorclub.com. We’d like to think that we have the most comprehensive listings in the state but if we don’t know about it, we can’t let others know! So get ’em in here and we’ll get ’em out there! Looking forward to another great car events season. We’re hoping to have one new car event this season (in addition to our 2011 Labor Day Toys-for-Tots Car Show/Cruise and perhaps a 2011 Fall Exotics Gathering) — an event organized by the Portland Police Activities League (formerly “Athletic” League) — a Youth-Oriented Car Show & More especially designed for teens and other young people. We expect to have some sort of People’s Choice Car Show, some cool late model cars, some old and new police cars, some special educational and safety activities (a texting-and-driving danger demo, mechanical and detailing demos and contests), prizes, raffles, music and more! The crew from Portland Detailing (http://www.PortlandDetailing.com) will also be on hand to teach some detailing and cleaning tips. This is tentatively scheduled for Saturday, June 25. The success of this will depend on getting the word out to young car enthusiasts — kids who are interested in classic and the latest hot cars, mechanical skills, car care, public safety, and more. Something special to do with the right young person — your child, your grandchild or a friend of the family. We are also looking for volunteers to help out with this event. If you are particularly interested in cars and young people showing an interest in them, please be in touch with Portland Motor Club via our website (http://www.PortlandMotorClub.com) or by phone (207-775-1770). Labor Day Car Show… Ferrari & Exotics Cruise… New Chrysler Dodge Jeep Dealership… Winter Storage… Whew! 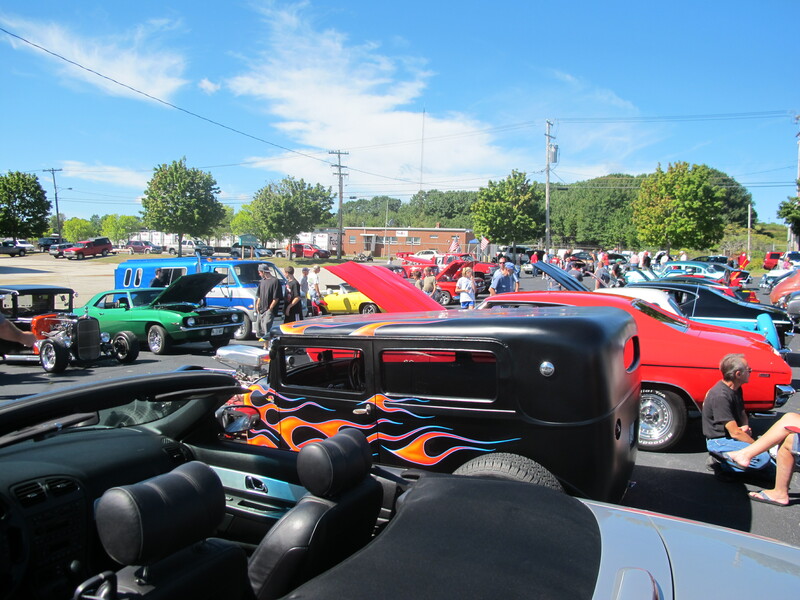 LABOR DAY TOYS-FOR-TOTS BENEFIT CAR SHOW… Well, another huge success! At least a couple hundred cars were on hand and several hundred people to enjoy a truly impressive selection of all types of vehicles. See photos. Thanks to everyone’s generosity, we sent the Marines back to their secret hide-out with hundreds of toys which will be distributed actually in the very near future to needy families in Maine — and there are lots of them these day, let’s not forget. Our huge lot filled up before the opening bell and they kept coming. At one point, almost all of Presumpscot Street was lined up with cars from one area club as they arrived en masse to support the event. Many thanks to all who joined us and helped out in many ways — especially Stan and Cheryl Page who tirelessly promote the event all through “cah season”, the United States Marine Corps to receive and organize the toys, Portland Motor Club for providing the space (it’s not really “our” event — it’s the combined effort of all the clubs that participate), the toy donors and money-for-toys donors, the Monday Night Posse (MondayNightPosse.com) for making some great noise, the vendors and especially the folks who brought out their amazing vehicles to support the event. It wouldn’t be nearly as impressive without the cars! Plan on it for next year. 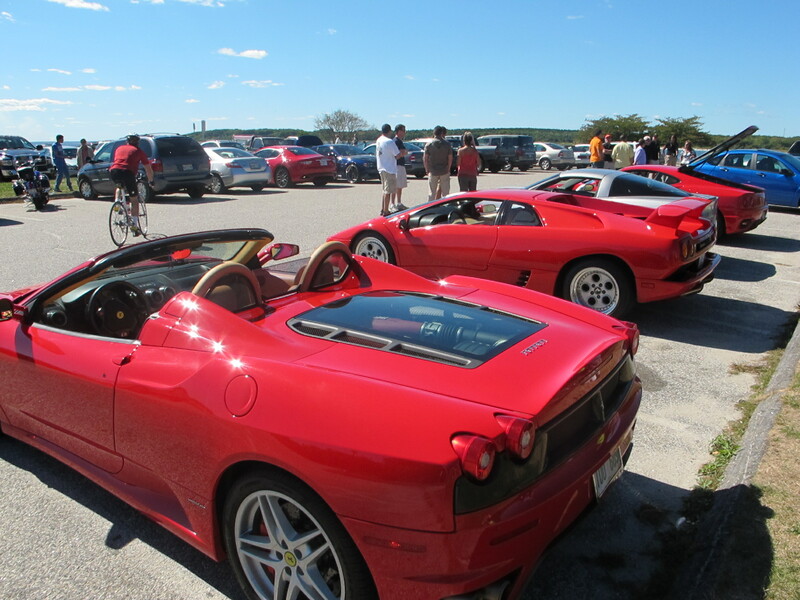 FERRARI & EXOTICS CRUISE… Less than a week after the Labor Day show, we had a very exciting special event in collaboration with Ferrari of New England. It was our first annual (?) Fall Exotics Cruise. We had fun appreciating each others’ cars and enjoying a light Italian lunch in honor of the Ferraris (including a rare SuperAmerica model), Maseratis and Lamborghinis that were the centerpiece of the event, but other more-than-fine vehicles were represented including an Aston Martin DB9, a Bentley, a Mercedes SL 55 AMG, a customized BMW, a Corvette Z06, a new Dodge Challenger, etc., etc. The group then lined up for a cruise over to Kettle Cove Beach in Cape Elizabeth (Two Lights was out because of the gravel road and maneuverability issues). It was a beautiful day and we certainly made the day for some unsuspecting young guys who happened to be in the lot at the beach – that is not something you would expect on a Saturday afternoon in September at the beach – several handfuls of the finest automotive eye candy! SOUTHERN MAINE MOTORS CHRYSLER DODGE JEEP SUPERSTORE… If you’ve ever been to Portland Motor Club – and our Labor Day Car Show is the one day of the year that we actually open up the facility (somewhat) for the public to take a peak – you might have noticed the very impressive MOPAR muscle car collection – well, it would be hard to not notice. The owner of Portland Motor Club is what you might call a “true believer” in the Church of MOPAR. One his automotive dreams came true this fall when he had the opportunity to purchase his own Chrysler/Dodge/Jeep dealership. 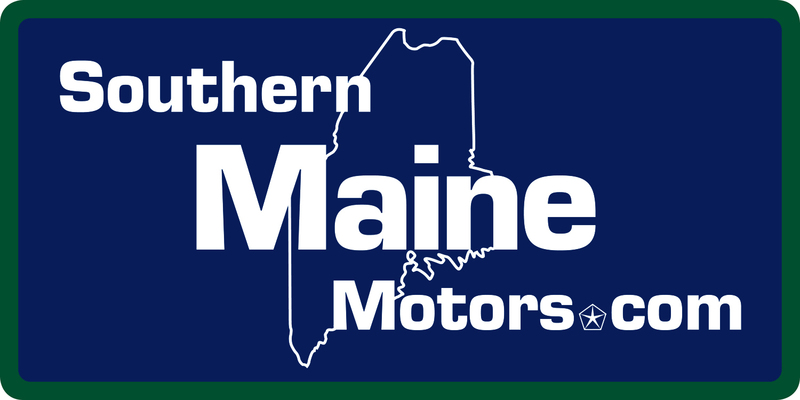 We can now all say “Goodbye Jolly” and “Hello Southern Maine Motors”. The well-known Jolly John’s dealership in Saco, Maine has been sold and is the proud new home of a renovated and rejuvenated Southern Maine Motors Chrysler Dodge Jeep Superstore at the same address. Next year, there will be a complete remodeling done there to build a top-of-the-line Chrysler Dodge Jeep facility. And we have enjoyed bringing some of the oldies-but-goodies down from Portland Motor Club to the Southern Maine Motors showroom to visit with their modern-day descendants. So, please visit us online at our great new website at SouthernMaineMotors.com to see all the great stuff that is happening there. Even better, stop by to see the handsome new showroom and other improvements and the lot FULL of Chryslers, Dodges, Ram Trucks and, of course, Jeeps. It’s a great sales and service crew there — we were fortunate to discover an enthusiastic and talented team already working there! We do expect to have some classic car fun down at the dealership next summer, too! WINTER STORAGE SEASON… is upon us. With snow in the forecast for this weekend, there’s no use in pretending that that isn’t winter knocking on your door. We did have an amazing summer with near-perfect cruising weather. The fall was more of a mixed bag but with still plenty of vehicular enjoyment opportunities. But now it’s time. If you need to store your special car with us for part or all of the winter, we will make space for you (without crowding anyone). Heated, climate-controlled, secure car storage is available by the month or by the season. We can even provide shorter-term storage if you are going on vacation and want your car to be garaged in our great facility rather than at the less-than-great airport parking lot. And why not get that long-overdue thorough detailing done while you’re gone by our fantastic Portland Detailing crew (PortlandDetailing.com). Be in touch and we can help you coordinate all that. And speaking of Portland Detailing, we will now be offering our car care expertise at our Saco Southern Maine Motors location as well. Sorry to throw all that at you at once but it’s been a busy fall, especially with getting our new dealership off the ground. If you’re more of a Volvo or Saab type, please check our PortlandVolvo.com and PortlandSaab.com websites if you’re in the market. Yes, it’s cars, cars and more cars around here – and that’s the way we like it! MAINE CAR SHOW & CRUISE-IN LISTINGS UPDATED for 2010!!! What an amazing car season we can look forward to in 2010! Thanks to our friends at CruiseMaine magazine and cruisemaine.net sharing their listings and adding some of our own, we have (hopefully) the state’s most comprehensive listing of Maine Car Shows & Cruise-Ins throughout the state. Kind of like that joke about Maine weather — if you don’t like the weather, wait a minute… if you don’t see a car show or cruise-in you like, wait a minute or a day, anyway. There’s something going on every day of every week this summer for cars and their owners. So, get out there and show it off and have some fun. It’s almost too bad that there aren’t any this April because it’s been so beautiful — hopefully a good sign for the summer season. And, by the way, we will be hosting the Labor Day Toys-for-Tots Cruise-In at Portland Motor Club again this year on Monday, September 6 — hard to imagine topping last year’s event but we’re game! We expect we’ll see and hear from our friends at the Monday Night Posse again this year — there’s actually music footage from last year’s show online on their website www.MondayNightPosse.com. If you have any additions or corrections, please be in touch right at at <info@portlandmotorclub.com> or call us at 207-775-1770. We want this list to be absolutely accurate and could really use your help if you know that something’s not right on it — and thanks!